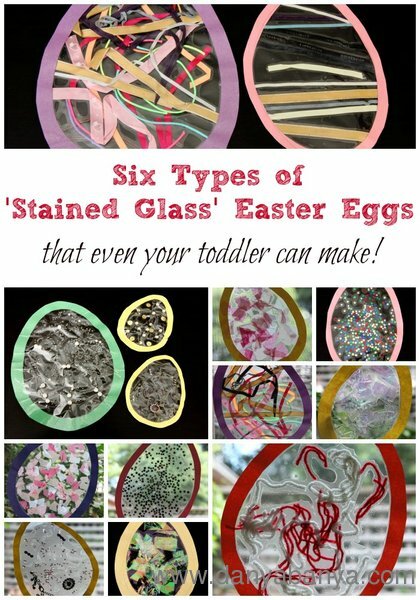 Have you ever made faux stained glass / suncatcher window displays with your children? 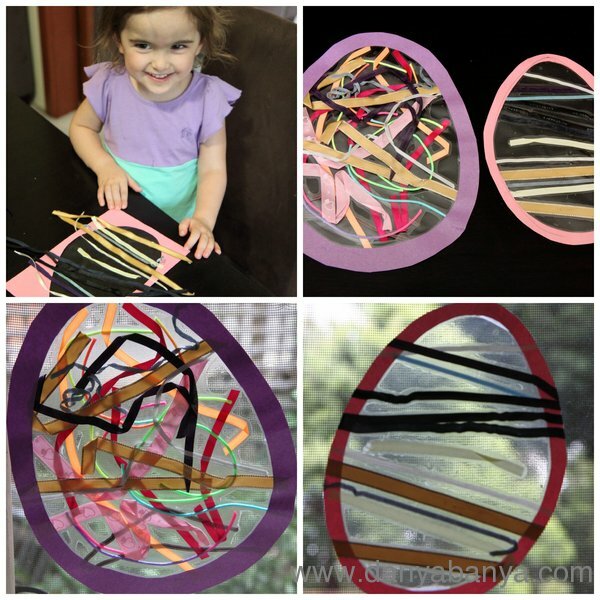 This is a nice easy craft activity that toddlers can help with. Did you diligently save the lovely tissue paper from past presents? Oh good! (Great to know I’m not the only hoarder…) Here’s a chance to use some of it up. 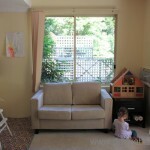 It looks really good on the windows as some of the light still penetrates. 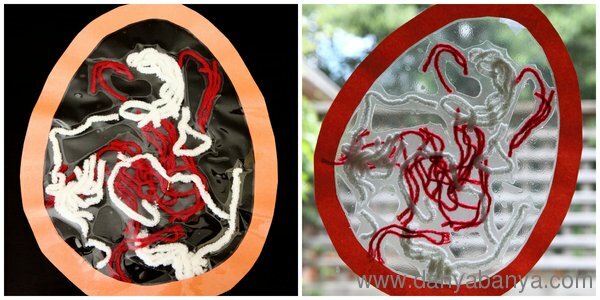 Being both shiny and transparent, cellophane is an awesome medium for window crafts. 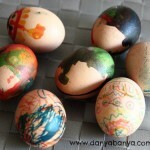 These turned out to be really easy and effective. I just precut the ribbons to size, and showed JJ how to place them in horizontal lines, and she was able to actually do it all herself. It looks really striking on the window. 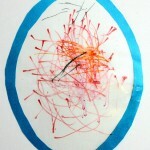 Then I let her do the squiggly one to satisfy her rebellious streak. There are three types of jewellery eggs here. The first (large green) one is fake pearls and tiny clear beads. The second (bottom yellow) one is using up the pieces of a broken bracelet. (Both of these were included in a bag of crafting goodness that a friend gave to me a few weeks back. Thanks!) And the third one is using the bibs and bobs from an old and broken hanging mobile. I thought this would be a good way to bring these pieces to life in another form. Word of warning – this sort of jewellery is a choking hazard. JJ (my eldest, at 2 years and 9 months) is no longer in the mouthing phase, so I was comfortable letting her use these for crafting under supervision. However use your discretion as to whether this would be suitable for your own child. 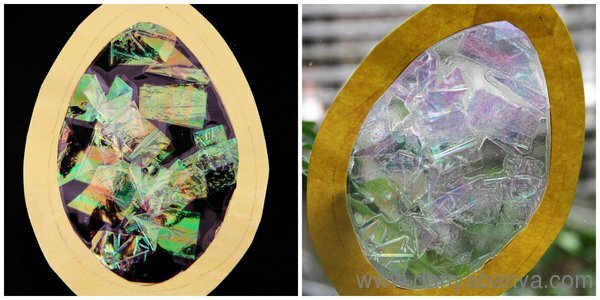 Would you want to make some ‘stained glass’ Easter eggs too? It’s easy! First off, start out with a cut-out. 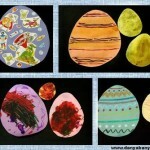 I used Easter Egg shaped cut-outs, partly because it it that time of year, and partly because I already had them from when we decorated paper Easter Eggs earlier this week. Then roughly cut two pieces of pieces of self-adhesive contact paper. Your pieces of contact paper need to be at least big enough to cover the hole in the cut-out entirely with about an inch spare on all sides. 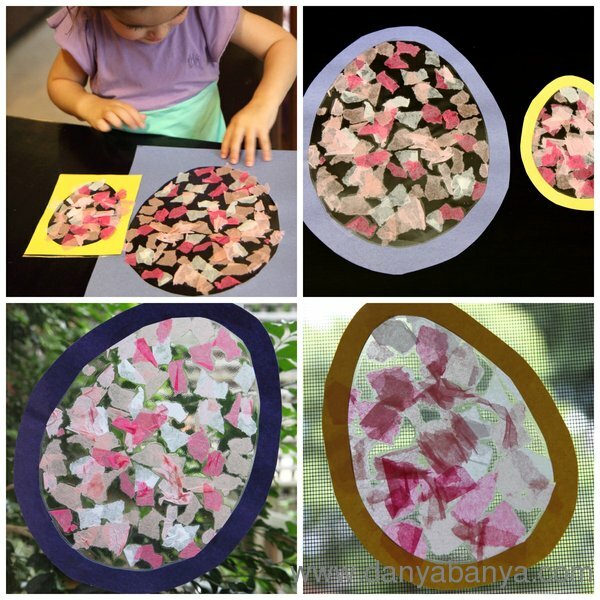 Then set out the cut-out, along with some items for sticking, and invite your toddler over to have a play! 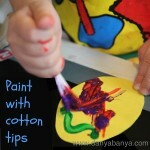 This is really easy even for very young toddlers as there is no glue involved. Once they’ve declared it’s finished, cover with the other piece of contact paper to seal, and then cut around the edges to tidy it all up a bit. And then stick it on your window! You might also like to subscribe to our newsletter, and receive our activities via email.